I hope you are having a deluxe summer! We (Gail and Melissa) spent June 24-July 4 and July 22-31 in Maine, doing what we call an "IFS Blast"--trading IFS sessions with each other. Over the course of our 21 days together, we traded 32 IFS sessions -- for a grand total of 64 sessions! We used finger puppets for every one of those 64 sessions. We learned exciting new things about our own parts, about IFS, and about how using finger puppets can deepen, clarify and enhance the practice of IFS. We look forward to continuing to share our insights with you through this extremely sporadic newsletter! We hope to send out a newsletter in the fall, sharing some of what we learned this summer. Meanwhile, for anyone going to the IFS workshop at Kripalu, Melissa will be there August 24-29 and will be bringing puppets! 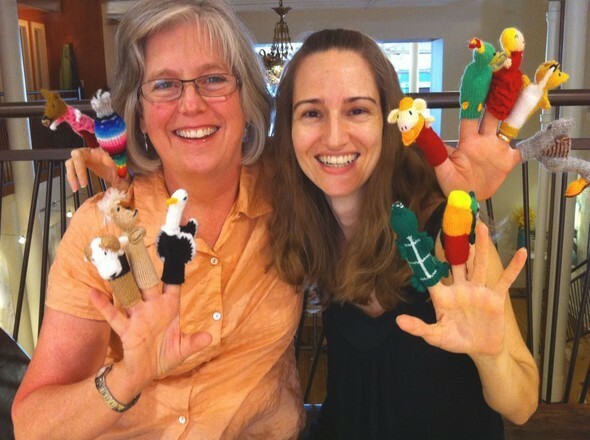 If you are near western Massachusettes or are going to the workshop and want a certain kind of finger puppets, email Melissa and she'll make sure to bring the set you want. If you're not in the area but would like some finger puppets, no problem--we can send you whichever set your parts desire! 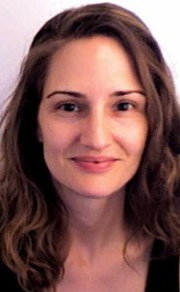 To get a set in person at Kripalu, please email me, Melissa, to let me know—even if you aren't sure. That will help me figure out how many sets to bring. You can reserve a set to be sure you get it! Otherwise they will be first-come, first-served until they're gone. This starter set ALWAYS includes a dragon! Animals large and small, from crickets and caterpillars to horses and hippos, cranes and peacocks, offer opportunities for representing a wide range of parts! All sets contain 17 finger puppets from Peru. Puppets are handmade, so we can't guarantee the same color or style puppet as pictured. Also, certain animals may be out of stock, so we can't guarantee each animal pictured will be in each set (except the dragon). Animals in Set 1 do not overlap with animals in Set 2. People are in high demand and often out of stock, but we have amassed enough to offer a diverse set of girls, boys, men and women, including doctors, nurses, angels, lumberjacks, hula girls and more! Individual puppets vary by set. Bright sets are made of acrylic fibers. They are vibrant and have the most variety. Individual puppets vary by set, but people in set 1 do not overlap with people in set 2. From chefs and ghosts to Pinocchio and Little Red Riding Hood, mermaids and hula girls to cowboys and cowgirls, set 2 has another diverse set of 17 bright, engaging puppets perfect for externalizing a broad range of parts! If you look closely at the sets, you can see subtle variation, even between the bright organic animals and natural organic animals. Not only are they different between different types of sets, but each individual puppet has a different expression and energy. For instance, I have two parts that both do the job of denying what I know--they say, "You can't see that." They are both ladybugs, but one is a stronger protector than the other. If I get the mellower one to step aside, up pops the stronger one. So I have two puppets to represent this subtle variation. One is a natural organic ladybug with lighter colors (mellower part), and one is a bright organic ladybug (stronger part). Organic sets are made of 100% organic cotton that is dyed with brighter colors than the natural sets. These sets are incredibly beautiful looking and feeling. 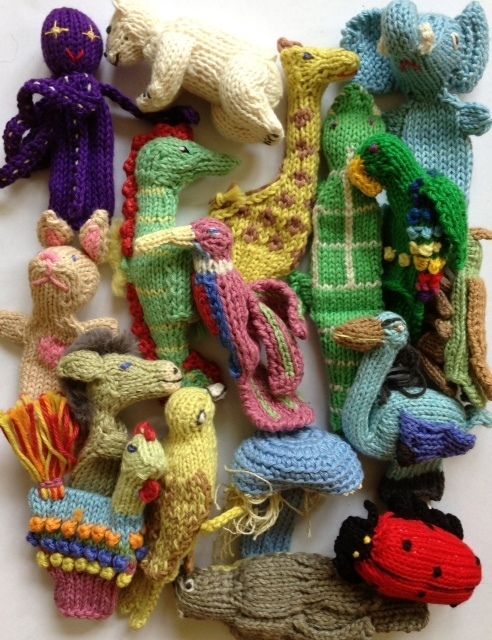 From hummingbird and canary to octopus and seahorse, elephant and giraffe to bunny rabbit and ladybug, these puppets offer powerful ways to connect to your parts from a place of compassion, creativity and curiosity! What's the difference between natural organic and bright organic? Both sets are made of 100% organic cotton. The natural sets use natural dyes on the cotton, so they are the most environmentally friendly set we carry. The colors are more earthy—which some people find very calming. People are not available in natural organic. Organic cotton has a very inviting tactile quality. Because there are less organic puppets available, we only offer one animal and one people set in bright organic. Individual puppets vary by set. All sets have 17 puppets, which we've found is a 'just right' number to start with. You can find many of the same people in both organic and bright (acrylic) versions. If you have two parts that are similar but not the same, one can be bright, and one can be acrylic! The economy set features 17 people and animals together in a random mix. While the puppets are not as high-quality as the other sets, they are a great way to start using puppets—and unless you're a puppets connoisseur like we are, you might not even know the difference! (Stand not included). 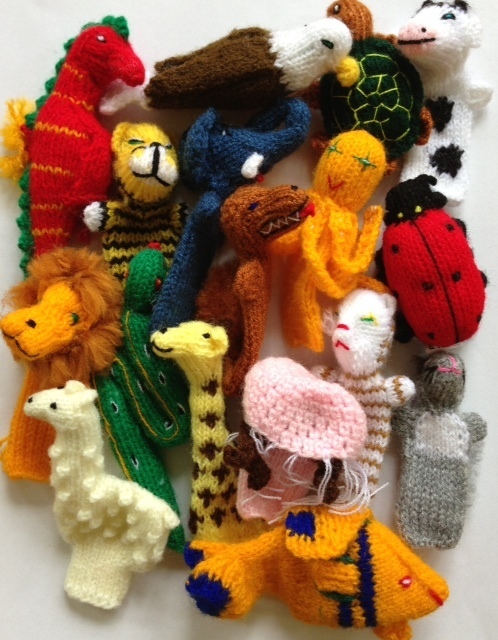 Participants at Kripalu said extremely moving things about the power of finger puppets to support their IFS work. 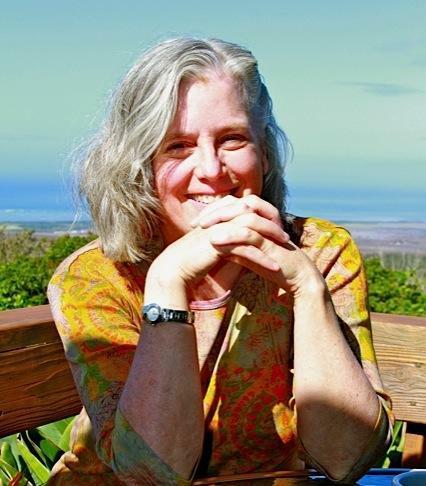 One woman said, "I feel like my parts are more real this way. I am taking them home in a bag!" We experience first hand in all our finger-puppet based IFS sessions that the more real our parts are to us, the more healing they can receive. That is why we are so passionate about this way of doing IFS! Thanks for taking the time to read our newsletter, which allows us to share our enthusiasm for externalizing parts work with puppets. Where is that IFS & Finger Puppets video? Click here! ©2019 A Thousand Paths • LongRunShortCut | 3220 W. Leland Ave.